Finding the right saddle for your horse can be difficult. A saddle that doesn’t fit correctly can cause discomfort, sore back muscles and an unwilling attitude from your horse. Although saddles come in all different shapes and sizes, you will need to find a saddle that fits your horse correctly. Fitting should be carried out by a qualified saddle fitter. However, as the rider we would recommend you are equipped with the knowledge to position a saddle correctly and identify any signs that a saddle no longer fits or requires attention. So, to help you out, we have written this article to advise you on how to check the fit of a saddle. By following our saddle fitting advise, you should be able to confidently check the fit of a saddle and ensure the comfort of your horse. We hope that you find this article useful. Before you can proceed with fitting a saddle, it is important to make sure that you horse is standing straight on a flat surface. Your horse’s position during the fitting must be standing straight and not resting a leg so that you can fit the saddle correctly. As well as standing on a flat surface, your horse’s back should offer a good bearing surface for the saddle. This means, the saddle should have good contact along the horse’s back and there should be no bridging in the centre or movement as you ride which could cause discomfort for both yourself and your horse. Once the saddle is placed on the back, you should be able to look down the gullet and see daylight. Top Tip: It is important that the horse’s spine should not be in contact with any part of the saddle so you do not cause damage to the horse’s back. 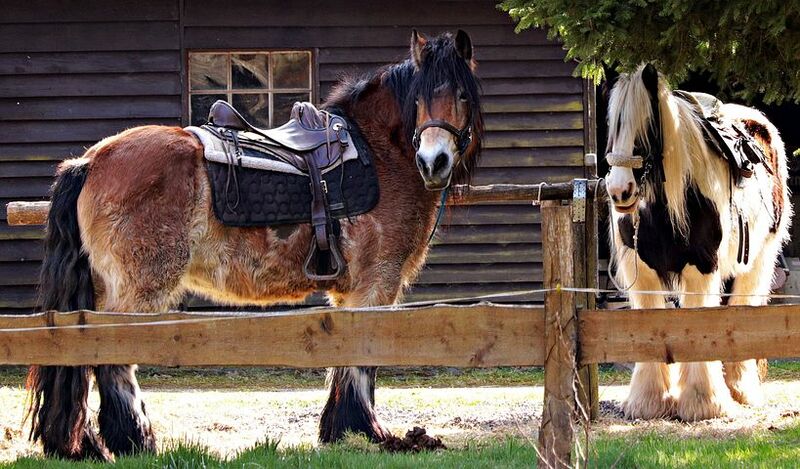 It is always important to position the saddle correctly on your horse’s back. We would recommend that you place the saddle directly onto the horse’s back, without a saddle pad, so that you can see how the saddle sits. When placing the saddle, sit it slightly forward on your horse’s withers, then slide it backwards until it stops at the natural resting place. The natural resting place for the saddle will differ per horse as it is dictated by the body conformation. Move the saddle backwards and forwards until you are aware of the spot where the saddle repeatedly stops, this is its natural resting place. This resting spot should place the saddle behind your horse’s shoulder blades to allow it freedom of movement and comfort. Top Tip: Do not place the saddle too far forward on the withers as, when the rider’s weight is added to the saddle, the saddle can press on the horse’s shoulder blades, causing pain or discomfort and often hindering movement. The back saddle should not sit too far along the back, as the horse is not designed to take weight on its lumber region. The saddle should be placed on a broad-bearing surface with the weight distributed evenly along the horse’s back. Once you are satisfied that your saddle is sitting correctly on your horse and is comfortable, your duty doesn’t end there. You must be diligent in checking the fit of your saddle regularly. Changes in your horse’s physical appearance and behaviour may make evaluation of the saddle fit necessary. Knowledge of your horse and his behaviour is helpful as changes in behaviour may also indicate that a saddle no longer fits comfortably. You should always be aware that your horse is constantly changing, growing and developing and therefore the saddle will need to be regularly checked and possibly altered. There are numerous saddles you can purchase that can be adjusted for ultimate comfort. This means you can get the ultimate saddle fit for your horse, adjusting the saddle where necessary. In addition, being able to adjust your saddle means that your horse can change shape and you can simply re-adjust the saddle to fit properly again. Saddles can range in price depending on the quality. However, for more specialist saddles you can expect they will be more expensive. Here at Prime Stables we recommend, for first time buyers, to pay a little bit more for your first saddle and be sure to get the best one you can. If you do this, you will definitely feel the rewards whilst riding and your horse will certainly thank you for it. If you are unsure, the advice of a qualified saddle fitter should be sought. For further information on horse saddles, be sure to check out our article on how to care for your horse’s saddle. If you would like further advice, please do not hesitate to get in touch with us. We are always on hand to give advice and help you with anything you may require.